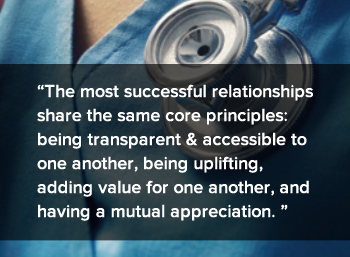 Young clinicians often ask me about how I build successful relationships with patients, and what they don't realize is their question actually provided the answer – it's a relationship. Think of your most successful (ie enjoyable or even motivational) relationships, personal, business or otherwise. They all share a few core principles – being transparent and accessible to one another, being uplifting, adding value for one another, and in general – there's a mutual appreciation. Why should the doctor-patient relationship be any different? Good hygiene: Bad breath, dirty clothes or body odor can be very distracting for a patient and reflects on your professionalism. Professional clothing: it doesn't need to be formal wear, have it suit your personality and values. Keep it cleaned and ironed. Be curious and interested: genuinely. Be empathetic: it's not easy for every patient to step into your office, or to be open with someone they've just met. Listen attentively: it's a given, but let them talk and ask inquisitive questions. Act responsibly- do what you say you are going to do (phone calls, lab results, research their case, follow-up care, etc): this goes a long way to building trust. These are some of the basics in order to connect, and have a "second date" as a possibility. I'm not talking about being inauthentic here, I am talking about stepping up into fully connecting and thriving, striving to be our best, address our weak spots and improve ourselves so that we can help improve others. If I don't smell good — easy to address. If I don't look so good —manageable to work on. If I don't sound good – I may need help in learning how to clearly articulate my thoughts. If I have some "issues" around my behaviors— go to counseling and seek resources to address and resolve. Only after you've manifested a desirable behavior and presented your best self will a true relationship be possible. Choosing to be a physician, of any kind, is choosing to want to connect and wanting to make a difference in the lives of those we work with...and it requires them wanting to spend time with us. Connecting is just a part of the role, but we shouldn't overthink the "how" when building a relationship with our patients - we're all just humans.